The holidays can be tough for people who, well, don’t like people. OKAY maybe that’s a little harsh, you love people, but eating cookies indoors with them for over a week can bring on some serious stress. And just when you think the obligatory holiday activities are coming to an end, bang! New Years Eve arrives. Potentially the most FOMO-inducing holiday of them all, NYE is a time when the pressure to be dressed up and fun is at an all time high. So introverts, I’ve put together some tips, illustrated by Marjanne Mars, for how to take on December 31 without covering your head in a paper bag (although that would also work). 1 . To get out of going to your New Year’s Eve party, tell your friends you were SO excited and festive that you got glitter in your eye and now cannot see the past, present, or future. 2. Tell people you don’t believe in the Gregorian calendar and so December 31 is just another rotation around the sun to you. No party necessary! 3. If you’re attending a party where you don’t know many people, pretend to speak very little English. People will think you are exotic and fancy and you can just nod, smile, and sip in mysterious silence. 4. Photoshop yourself into a tropical location and pretend to be ringining in the new year “island style”. No one will be fooled, but you’ll probably get points for creativity. 5. If you choose to attend a party, it is imperative said party has a dog. This dog will be your date. Stand by it’s side all night; remember, it’s rude to leave your date at a party! 6. Grab a tray of champagne and pretend to be the cocktail waitress. Everyone will greatly value your presence, but no one will force you into long conversations that never get past loud small talk. Another benefit of this technique? First dibs on the best booze. 7. 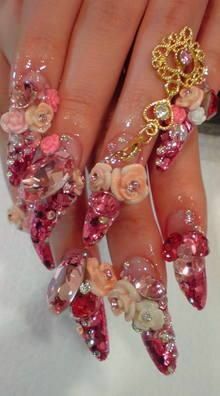 Get one of those ridiculous, impossible-not-to-look-at manicures so people won’t ask “How’s work? or “Are you seeing anyone?” and will probably just avoid you because you are a human enigma. 8. Tell the truth. You’re tired, grumpy, hungry, and just really want to watch the new Gilmore Girls season for the third time. Your friends will be so surprised by your honesty that they’ll let you off the hook.